If you can't decide between crunchy, melt in your mouth or chewy, this is the collection for you! 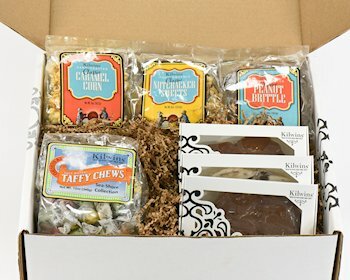 Our "Grand Taste of Kilwins" features three 8oz flavors of Fudge, a 12oz bag of Sea-Shore Taffy Chews, and a collection of our Made in Store Corns (5oz) and Brittles (14oz). To select your three flavors of fudge put your preferances in the order comments section.